Fishville's Notes: Is Stanford having an identity problem? You would probably say so at least for the Chinese World as Stanford in Taiwan or Hong Kong was called 史丹佛; but in mainland China it was translated into 斯坦福. Two names do not share a single Chinese word. It was indeed odds for such a wonderful university, part of reasons for this is probably due to its relative short history. Stanford’s president might have a duty to make its Chinese name straight by taking a similar action that South Korea’s government did for Seoul’s Chinese translation. In addition, Early last year (2010) from collegeconfidential, I saved this post presumely from a Stanford student commenting their school, it is hilarious as he said that "Apple laptops, organic food, and Barack Obama. If you don't love all three, you won't fit in. ", any Stanford kids or their parents could verify if any of these comments was true? I don't know the true identity of this student as he claimed he is a Stanford graduate student but someone said he is from UC Berkeley. 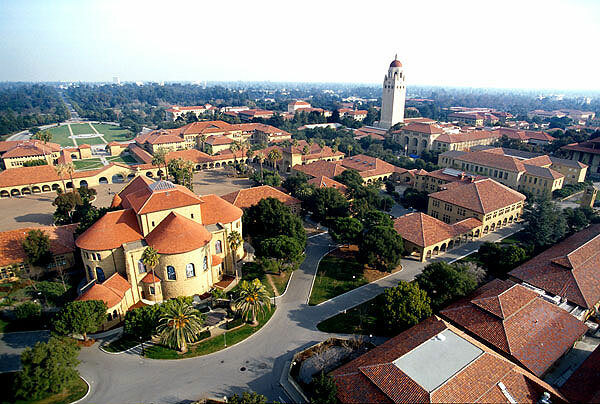 Making no mistake, Stanford is one of our most favorite colleges in the United States. Yale's current president Richard Levin and provost Peter Salovey were all graduated from Stanford College before they got their PhDs from Yale. Harvard's former president Derek Bok was also graduated from Stanford College before he got his degree from Harvard Law School. In some perspectives, Stanford is even more comprehensive than Harvard considering the later does not have a sizable engineering program or school. -It rains pretty much every day. -The weight room is absolutely pathetic for the size of this school. The equipment is old and the place is packed all the time. -The undergrads here are completely unremarkable. I have no idea how this school ranks so high. -Apple laptops, organic food, and Barack Obama. If you don't love all three, you won't fit in. -Class size. I've only had one class with under 50 people since I got here. -Want to talk to your professor? Good luck catching them during their one hour of office hours per week. -Only about half the student show up to class on time, which means that every minute for the first half of class, a student will stumble in and slam the door. -Not enough bike racks. Good luck trying to get your bike out of the heap of tangled metal after spots run out and people just start parking their bikes anywhere. -Want only a superficial overview of topics you're interested in? Then the quarter system if for you! -Bike riders don't obey traffic laws. It's pretty bizarre to see so many people ignore stop signs and fly into busy intersections under the assumption that cars will yield to them. That's enough for now. Just had to get that off my chest..